The VOID is the perfect device for beginners and experienced vapers. An all in one e cig device that combines the latest and best technology with high-quality German design. Equipped with a high performance 1500 mAH battery, the best anti-leaking structure with 2ml e-liquid capacity makes the device outstanding. Capable of both sub ohm and standard vaping this Pen Style vaporizer is also optimised for both normal e liquid and high VG ratio e liquid. The Void makes an excellent shisha pen and can be used with our range of vape juice and the shisha juice range. 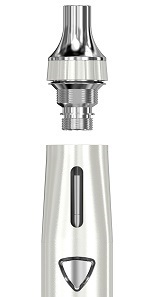 Both Atomizer Heads can be used with both high PG and High VG e liquids. Use the 0.6 Ohm head to optimize your vape experience to produce bigger clouds and a more intense flavour with high VG e liquids. The 1.0 Ohm should be used by anyone who is switching from smoking cigarettes to e-cigs and for PG liquids. 1.0 Ohm makes you puff more intensely or creates a harder draw which enhances the flavour. XEO VOID is available in 4 galactic colours. The Void vape pen is one of the very few TPD2 (Tobacco Product Directive) compliant sub ohm pen vaporizers. Thanks to the use of the highest-quality raw materials, the VOID Vaporizer Starter Kits are uniquely designed to eliminate the inhalation of any carrier chemicals or contaminants that may contribute to any health complications. Designed to be uniquely user-friendly the VOID works to limit exposure as much as possible while providing the most pleasurable vaping experience. XEO VOID provides an excellent balance of ingredients and heats in their products. Careful construction goes into each product, providing a cleaner alternative to the hazards of standard E cigarettes and vapes. The net benefits to one's health are obvious on a scale of health risks, considerably lower. Your XEO Void vape pen is manufactured with precision so will not leak providing you use the product and parts correctly. Where any leaks have occurred, we have solved almost all by taking the following steps. Bought one of these a few months back after struggling to get the hang of this vaping lark. Have now given up the fags and have bought another as a spare. Best vape pens that I have come across including a far more expensive one. The xeo void vape pen from Germany is the only pen I use after trying it about a year ago. It's hefty in the hand, and NEVER leaks! I am an ex cigarette smoker and this product satisfies those old cravings completely with the draw, and the clouds. The charge lasts for 6 hours for me. I have 3 of these pens now so you can guess I like them. This one is a replacement as the fire button on my first Xeo Void keeps getting stuck I don't know if it's just me but it is 4/5 months old. I plan to stick with this brand though as I've yet to find a better more stylish and discreet pen.